This soup has been there in my drafts for more than two weeks now. I had avoided posting the recipe because the photographs didn't turn out that good. But now I have no other option but to post this as I will not be cooking anything major for the next few days. The reason for this is my kitchen is undergoing a revamp again. And this time, they are changing the tiles. So I have kind of made a make shift kitchen in my dining area. Right now I am finding it extremely difficult to cook anything properly. But I am hoping that things should settle down in the next few days. Till then you will have to make do with this soup. If you browse through the recipe categories on my blog, you will notice that I am not much of soup kind of person. But during the past few weeks, the temperature here has taken a plunge. All though the whether is not all that severe, there is still that chill in the air which at times, makes you want to curl in that shawl. A chill that makes you crave for a bowl of hot soup. I was introduced pumpkin soup by my neighbor only a few months back. Before that I didn't even know that pumpkin soup existed. Leave alone taste it. To me, this soup was an acquired taste. I remember making a sorry face, when I took my first sip. And then the taste slowly grew on me during the 3rd and the 4th. It was only after finishing off half the bowl, I had realized that I actually liked the soup. After that, I started having pumpkin soup from time to time. No. I didn't make it. It was always delivered to me by this friendly lady. It was on a few weeks back that I decided to try making this soup at home. But instead following my neighbor's recipe, I decided to give this soup a south Indian twist. I knew that the combination of coconut and pumpkin went very well together. So I just thought of adding some rasam powder for the spice and Some how this soup turned out very aromatic. S who is one of the most fussy eaters, had two bowls of this soup. I even gave this soup to Purvi with rice and she absolutely loved it. I am not sure if I have reinvented the soup or the rasam. But then, who cares as long as it turns out tasty. Cook the pumpkin cubes in enough water till tender and cool completely . Drain the cooled pumpkin cubes and reserve the water. Blend the pumpkin cubes along with the grated fresh coconut and cumin seeds to a fine puree. Add the drained water if required. Take off the heat and serve hot garnished with some additional coconut milk. Beautiful photos...delicious looking soup. I would love to taste pumpkin soup! I've never had it before. The pictures are beautiful dear..yummy soup! love it, wow thick, rich and creamy !!! Yummy thick & nice pics..loved the color!! Omg, never thought of rasam powder in soup..pumpkin soup looks super tempting and inviting. Lovely lovely clicks dear..Soup sounds fabulous. 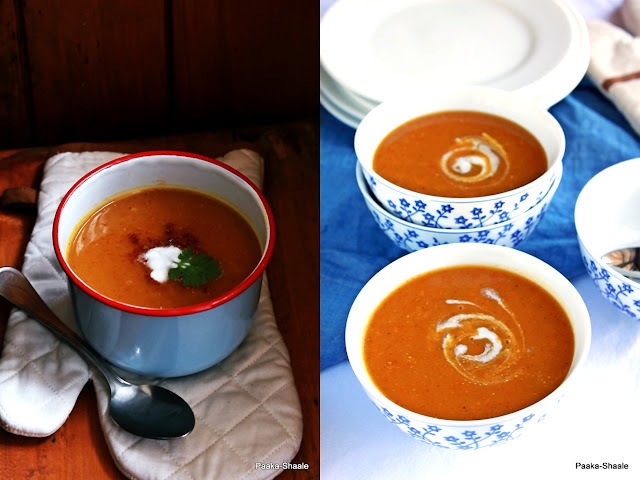 i love homemade soup... and i love winter squashes and pumpkins! yum! thanks for the blog visit :D. link up your #pastalove post when ready! its for the month of may. we have a new theme every month. if you are interested in hosting or just knowing about the different bloghop themes, you can join our facebook group (search "lovebloghop" and request to join!). have a great day! What a flavourful soup! Simply Souperlicious! Love the recipe and the clicks, lovely colours! Beautiful clicks and so unique! This soup looks yum! I like your choice of spices in it! Came across your blog and so glad I did!! Great little space you have here. I love love love soup and pumpkin so this is right up my alley. It is way too hot to eat soup here now, unfortunately. I will be keeping this recipe on hand for when the weather cools and pumpkin season returns! I live for Pumpkin soup. And yours is making me want a huge bowl of it. Loved the photos too, especially the first one- gorgeous!